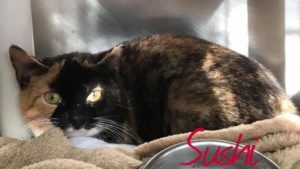 Sushi is a beautiful, lovable calico girl, born on 2/14/18. She was trapped in Huntington. Sushi was rescued, lovingly fostered, and is now seeking a forever home. Born on Valentine’s Day, Sushi would like to be your Valentine every day. Come meet the new love of your life!